Thursday, September 27, 2012, took place in the heart of the Bellevue lending library, Brest, a conference dealing with shipwrecks of the Iroise Sea. Organized by the strong dynamic team "Rendez-vous maritimes" (“Maritime appointments”) whose aim is to present complementary aspects of maritime culture (literature, maritime news, history) by enrolling in local or national events, this event judiciously completed the traveling exhibition about shipwrecks entitled "Memoires d’Iroise" (“Iroise memories”), an event based on a concept initiated by the valiant Brest Recherche Plongée team of divers who is a particularly active part of L'Expédition Scyllias. These western Brittany shipwrecks specialists, accustomed to local diving conditions renowned to be difficult, allowed an enthusiastic and curious public to discover more about the fabulous engulfed heritage of the Iroise Sea. This approach of heritage resources was made possible thanks to the presentation of works of talented underwater photographers and cameramen, each providing a look at this wild part of the ocean : Katell Henry, Alain Carnot, David Chapelle, Nicolas Job, CG Quillivic, Xavier Casey, Jacques Le Lay, Erwan Amice, David Tetart, etc. The conference was compèred by JLM and Nicolas Job, the first one referring to two remarkable subjects : the wreck of the British steamship Saracen and the one of the famous French navy schoolship Armorique ; the second one touching on different aspects of underwater photography. An attentive audience - and connoisseur for the most part - was able to discover, thanks to the magic of words and images, this passion for wreckdiving that drives L’Expédition Scyllias as a bridge with the past when sharing fun and knowledge occupies the first place. Exhibition to discover at the Bellevue lending library until October 13. 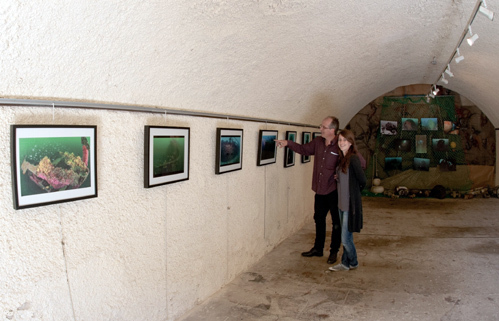 Left : The Priol, father and daughter, who initiated the project, are visiting the traveling photo exhibition - here at fort de Bertheaume. 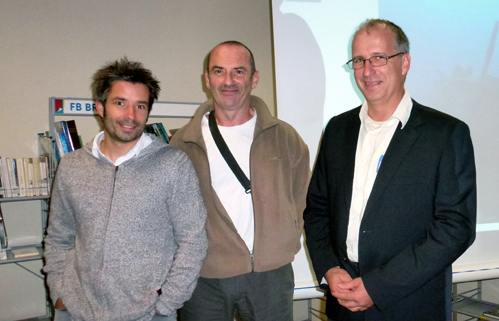 Right : the conference team (l to r) : Nicolas Job, JLM, Hugues Priol.